Today I present you with the second beer of a six-part series checking out beers brewed by Birra Tenute Collesi SRL in Apecchio, Italy. Again, these were given to me by their US Importer. Good luck with that website, too, if English is your only language. After thoroughly enjoying their Chiara a few days ago, today I chose their Triplo Malto or Tripel as you probably know it best here. This 500 mL bottle follows the same elegant packaging design as its brothers, with the only difference being this is the beer that got the purple label/neck decoration color scheme. And the back label sets the table for this specific beer and what to expect. Ingredients are typical, but "all [their] passion!" is also included in this bottle. Tons of floaties. I decided to pour most of the beer avoiding that yeast as I did with Chiara, then finish the really yeasty remaining part separately. Bottle recommends serving at 8°C. Here's the very simple formula for you anti-metric people. °C x 1.8 + 32 = °F. 46.4°F in this case. Great fruity aroma: orange citrus, apple, and some yeast. Mmm. The flavors are excellent so let's not waste any time getting to that fact. 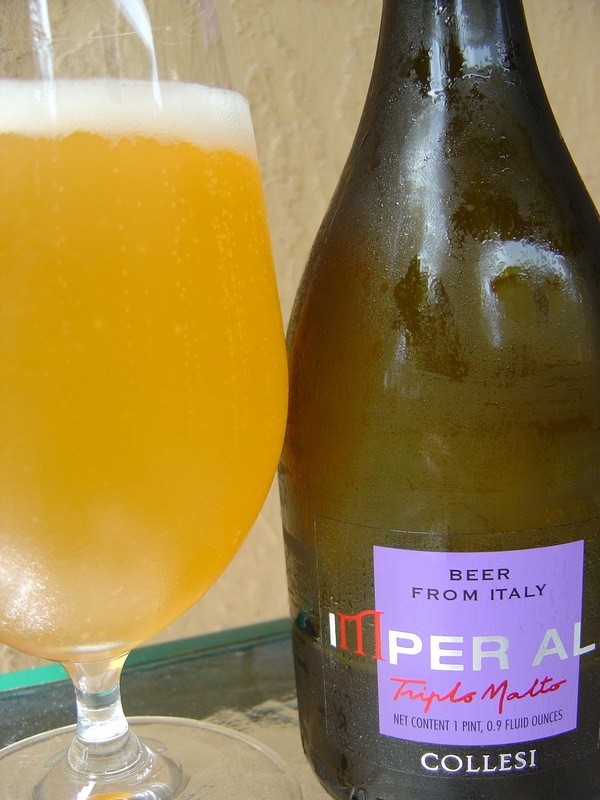 Wonderful fruity peach and pear combo starts things off, sweet and dipped/spiked with the 9% alcohol in this bottle. These flavors really wake up the taste buds and keep them dancing. Hints of honey and breakfast jam are very nice. Quite a fun and complex profile. Carbonation is fine and creamy, great texture. The beer has some yeasty characteristics and candi sweetness but they are just right. A hint of spice comes toward the end, and you are left with a long-lasting fruity sweetness at the finish. A light warmth in your chest reminds you that you just drank bottled love. The yeasty portion at the bottom was just another 50 mL of yum, and basically the same except for the appearance.